From April, the driving schools will be offering learner drivers a simple and timely introduction to today's world of locally emission-free mobility. The specially developed training concept is unparalleled in the way it tackles every aspect of electric mobility, focusing as it does on gaining familiarity and experience, as well as on the correct way to handle and work with alternative drive systems. The aim of the initiative is to integrate electric vehicles into the driver training process and so to generate enthusiasm for electric mobility, particularly among young people. The initiative is also designed to make the first experience of driving significantly easier for learners. Instead of spending their first driving lessons having to concentrate on the gear changes in a manual vehicle, they will begin with an electric vehicle – due to its automatic transmission there is no need to use the clutch or change gear, allowing learner drivers to focus on what's important: the traffic. Once they have acquired a certain level of routine in their driving, they continue learning on a manual vehicle with a combustion engine. By taking this approach, learner drivers are able to qualify with a full Class B or BF17 passenger car driving licence and, in addition, receive the eDriverLicence. The theoretical elements relating to alternative drive systems and mobility concepts will be integrated as a double lesson into the theory training and will cover the principles of alternatively powered vehicles as well as information about mobility services. Issues such as charging time, range, acceleration characteristics, recuperation and the awareness of the silent electric vehicles for other road users' will be addressed here. The eDriverLicence instruction element adds the topic of electric mobility as a complement to the basic driver training to achieve the class B and BF17 licence. Once they have passed their eDriverLicence driving test, young drivers over the age of 18 are immediately able to use the car2go service and drive electric. They can register straight away with car2go - and without incurring registration charges. On top of this, they receive a one-off gift of 100 free minutes. A total of ten electric vehicles equipped for tuition purposes have been provided by Daimler AG at a monthly rate to five selected Academy driving schools in the wider Stuttgart area. 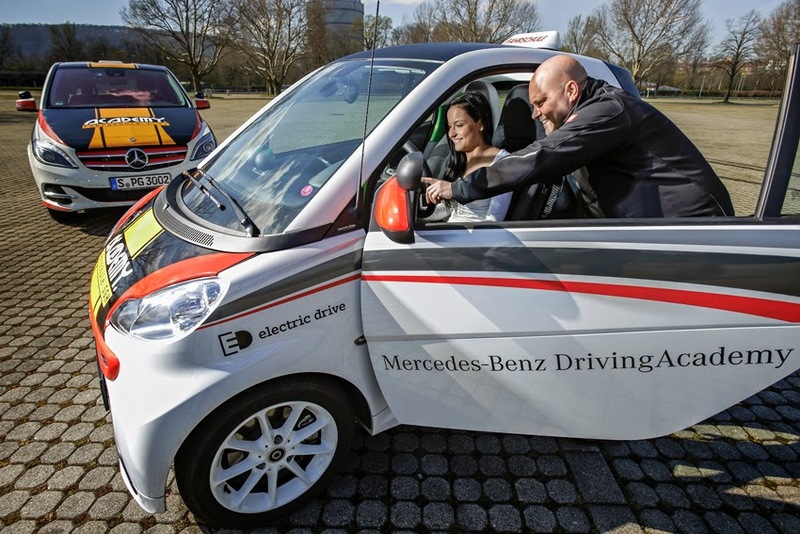 Each driving school will get one smart fortwo electric drive and one Mercedes-Benz B-class Electric Drive. As well as the vehicles themselves, each driving school participating in the pilot project has been equipped with a charging station (wallbox) to allow fast recharging. The project is headed up by the Mercedes-Benz Driving Academy. The Mercedes-Benz DrivingAcademy makes new drivers fit for driving.